In case any of you were wondering, I just got out of a 2-night stay in the jungles of Selai, which is part of our Endau-Rompin national park. Where I met tourists and students of nature from as far as Switzerland and Portugal, and as near as Singapore and PJ. A wonderful break from our crazy politics and mad politicians. But all good things must pass, and so I rode home and ended up straight into DAP's YB Tony Pua's war of words with 1MDB president Mr Arul Kanda. Today, "chicken" Arul calls YB Pua "monkey" albeit indirectly. Now, is that why I didn't see any monkey in Selai? We saw giant millipedes and ants and we had barbecued chicken, but no monkeys! Seriously, though, Pua is a member of the Public Accounts Committee (PAC) that is investigating the 1MDB's affairs. Common sense and professional courtesy would tell him that in order for the PAC to be and be seen as fair, members of the Committee must behave rationally and without prejudice towards the entity that's being investigated, especially towards the people who helm that entity (in this case, the 1MDB). What Pua's doing is the opposite. 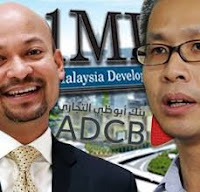 From the very start YB Pua has been exceedingly critical and rabidly unprofessional in his comments on the 1MDB and on the person of Arul Kanda, who has actually done quite a bit in reviving confidence in 1MDB since taking over in January. We refer to a press statement today by YB Tony Pua, further to his “chicken challenge” issued yesterday. We note that today, YB Tony Pua refers to himself as a “monkey”. On 16 January 2015, Arul Kanda, in good faith, offered to engage with YB Tony Pua and share with him facts on 1MDB. However, as evidenced by YB Tony Pua’s subsequent and ongoing conduct, it is clear he is not interested in the truth. Rather, his aim is to score political points, undermine ongoing investigations and negatively impact 1MDB’s rationalisation plan. YB Tony Pua is wrong to state that “there’s hardly anyone left investigating the company”. He has conveniently forgotten to highlight that lawful authorities such as the Attorney-General, Auditor-General, PDRM, BNM, MACC and PAC, are all currently pursuing investigations on 1MDB, in a thorough, professional and independent manner. • Further to an earlier joint venture arrangement in 2009, 1MDB invested US$1.83 billion cash in murabaha notes issued by JV Co, a company that, by then, was 100% owned by PetroSaudi following the termination of the joint venture in March 2010. • In June 2012, this entire amount was repaid by way of conversion into shares of PetroSaudi Oil Services Limited for a value of US$2.22 billion. • Subsequently, in September 2012, 1MDB sold its shares in PetroSaudi Oil Services Limited for US$2.318 billion and received fund units in a Cayman registered fund. These fund units were owned by 1MDB via its 100% subsidiary, Brazen Sky, and held through BSI Bank Singapore as custodian. • Accordingly, 1MDB invested a total of US$1.83 billion with PetroSaudi as murabaha notes, and ultimately received US$2.318 billion of fund units, representing a gain over time of US$488 million. • The valuation of the fund units was undertaken by the fund administrator and is clearly described in 1MDB’s audited financial statements. Further information referred to above can be found in the notes to 1MDB’s financial statements. Accordingly, contrary to Tony Pua’s claim, 1MDB has clearly provided detailed information on this – as above – on a number of occasions. Such “monkey business” by YB Tony Pua does not benefit anyone. Malaysia is not a jungle – we have due process, procedures and laws to be followed. Accordingly, the lawful authorities must be allowed to carry on with their investigations. 1MDB is very much focused on the implementation of our rationalisation plan to stabilise the company and reduce our debts to a sustainable level. Please let us carry on with our job.